Susan Cain’s acclaimed New York Times bestseller, Quiet, is now in paperback. 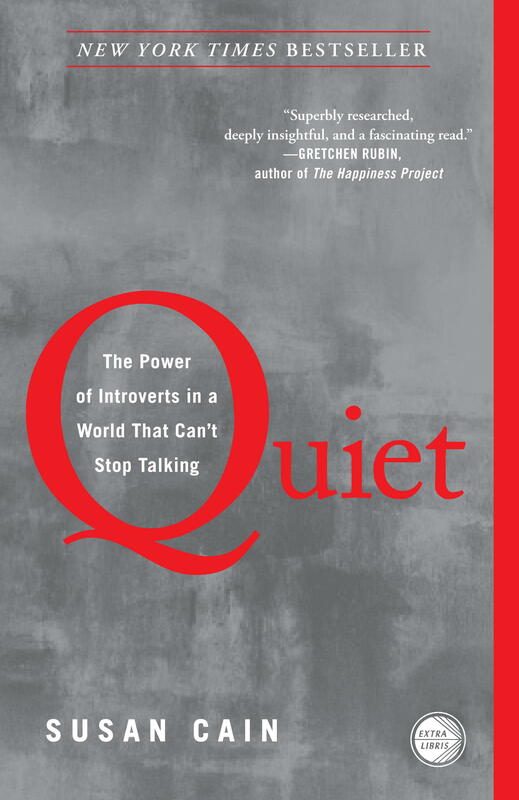 Passionately argued, impressively researched, and filled with indelible stories of real people, Quiet shows how dramatically we undervalue introverts, and how much we lose in doing so. This extraordinary book has the power to permanently change how we see introverts and, equally important, how introverts see themselves. This week, Educational Leadership, the flagship publication of ASCD (Association for Supervision and Curriculum Development) said this about the book: “Quiet will help teachers who hope to make classrooms more welcoming to introverted kids gain a greater understanding of how highly reserved children operate, how to respectfully coax them out, and how to help them learn to work comfortably in groups—in school and out.” We couldn’t agree more. And to read Susan’s article, “What Do Teachers Really Think of Quiet Students?, click here. I first thought about the powers and challenges of introversion some 26 years ago, when I began my freshman year at Princeton University. From the minute I set foot on campus, I saw that college could be an extraordinary place for introverts and extroverts alike. A place where you were expected to spend your time reading and writing. A place where it was cool to talk about ideas. A place where there were so many people, each doing his or her own thing, that you could create your own brand of social life. If you were an introvert, you could find friends with common interests and enjoy their company one-on-one or in small groups; if you were an extrovert, the social possibilities were endless, just the way extroverts like them. Several years ago I did some reporting on why so many kids drop out of high school, despite all rational incentives. That took me quickly to studies of early childhood and research on brain formation. Once I started poking around that realm, I found that people who study the mind are giving us an entirely new perspective on who we are and what it takes to flourish. We’re used to a certain story of success, one that emphasizes getting good grades, getting the right job skills and making the right decisions. But these scientists were peering into the innermost mind and shedding light on the process one level down, in the realm of emotions, intuitions, perceptions, genetic dispositions and unconscious longings. I’ve spent several years with their work now, and it’s changed my perspective on everything. In this book, I try to take their various findings and weave them together into one story. This is not a science book. I don’t answer how the brain does things. I try to answer what it all means. I try to explain how these findings about the deepest recesses of our minds should change the way we see ourselves, raise our kids, conduct business, teach, manage our relationships and practice politics. This story is based on scientific research, but it is really about emotion, character, virtue and love. We’re not rational animals, or laboring animals; we’re social animals. We emerge out of relationships and live to penetrate each other’s souls. President Obama has vowed that he will soon raise the issue of immigration reform anew, likely igniting heated debates in homes around the country. Yet in many high schools nationwide, teachers have already sought to help students better understand their newly arrived neighbors through discussions of Enrique’s Journey. Already, scores of high schools from Bay Shore, New York to Santa Monica, California—places that have seen a sudden surge of newcomers from other countries—have used my book about one Central American boy’s quest to reach his mother in the U. S. to take students inside the world of migrants, a world many know little about.